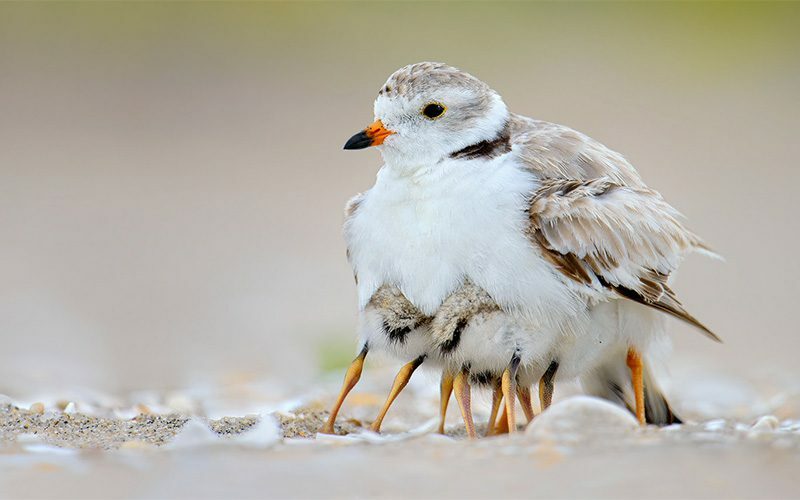 A Piping Plover seems to sprout legs as its chicks take shelter to maintain their temperature in the first few days after hatching. Photo by B. N. Singh via Birdshare. Dad brings a meal to a hungry fledgling. Northern Cardinals leave the nest when they are about 10 days old but their parents keep delivering most of their food for another 12-20 days. Photo by hawk person via Birdshare. A family outing for American Avocets. The young are able to leave the nest only an hour or two after hatching. They follow Mom and Dad to shallow areas with vegetation cover where they find their own food. Photo by Ken Phenicie, Jr. via Birdshare. A parent keeps watch over its chicks. Nestlings may be ready to leave the nest as soon as eight weeks after hatching. Photo by Keith Williams via Birdshare. Taking a stroll along the beach together. Young American Oystercatchers must learn how to find and pry apart clams, mollusks, and other marine invertebrates. Photo by B. N. Singh via Birdshare. This Black Skimmer chick has a long way to grow to match an adult's splendid bill. The long lower mandible helps skim prey from the water in flight. Photo by B. N. Singh via Birdshare. So many hungry mouths to feed! Bohemian Waxwing parents take turns delivering regurgitated buds, fruits, and insects to fuel their growing young. Photo by Andrew Spencer/ML 32798461. A Common Tern chick learns to take a fish from its parent and eat it headfirst. The chick that arrives first or begs the most usually gets the fish. Photo by Khurram Khan via Birdshare. True devotion. Ezra the Red-tailed Hawk keeps his eggs warm through a snowstorm. Featured for five years on the Cornell Lab’s live Bird Cams, he guarded eggs and chicks through rain, sleet, and snow. 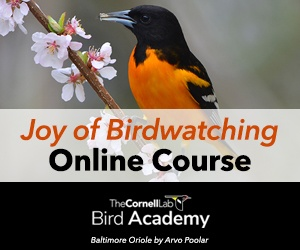 Photo from Cornell Lab Bird Cams. Family resemblance? Red-tailed Hawk chicks transform from their white downy plumage to their juvenal brown feathers ready for flight within just 6 weeks after hatching. Photo of Ezra and his nestling from Cornell Lab Bird Cams. Even in a massive colony, King Penguin parents can identify their own chick by its voice. The brown, fuzzy chicks group together for protection in a crèche, French for “crib.” Photo by Jacqueline Deely via Birdshare. Tender moment: Dad Kaluakane snuggles with his offspring Kaloakulua on the Laysan Albatross Bird Cam on Kauai. Photo from Cornell Lab Bird Cams. Multitasking, Pied-billed Grebe style. Chicks can climb onto a parent’s back less than an hour after hatching, to catch a ride and to stay warm. The parents feed their young for 28–68 days. Photo by Bob Gunderson via Birdshare. Snuggle time. After walking around and pecking for food, Piping Plover chicks return to their parent to warm up and rest. Photo by B. N. Singh via Birdshare. Dad’s home! Red-bellied Woodpeckers typically carry several insects or small fruits at a time to feed nestlings. The father broods the young every night until just before they fledge. Photo by Tom Muir via Birdshare. All aboard! Red-necked Grebes carry their chicks almost continually during the first week after hatching to help keep them warm and safe. After the first week, the young grebes gradually spend more time swimming, with a watchful parent nearby. Photo by Greg Schneider via Birdshare. Family mealtime. During the first 10 days or so after hatching, Sandhill Cranes mainly feed their chicks bill-to-bill. The parents may break apart large food and offer it to their chick in pieces. Photo by mnlamberson via Birdshare. Two Common Loon chicks stick close to one of the adults. The parents take turns watching over the young and going out fishing. Photo by John Pizniur. To celebrate Father’s Day, we’ve selected some of our favorite photos showing the importance of fatherhood in the lives of birds. Enjoy these touching moments that reveal how many young birds depend on Dad for warmth, safety, and a good meal. Special thanks to each of the photographers for sharing these glimpses of family life. Happy Father’s Day!